Chances are if you have wandered the trails and paths of the Meadowlands over the years, whether it was a birding trip or just enjoying the beauty of the parks, you’ve encountered a special person that stopped by to lend you a helping hand. It may have been explaining the differences between Greater or Lesser Yellow-legs, pointing out a flying Peregrine overhead, locating a rare species of wildlife or maybe just helping guide you in the right direction. In all likelihood that person was Chris Takacs, a volunteer caretaker of sorts, expert birder and a person with a deep a passion for the Meadowlands like no one else I know. Chris has called the Meadowlands home for many years. He cares for like it’s his home. I asked Chris what it was that makes him love the Meadowlands as much as he does. “The Meadowlands is my backyard,” he told me. “Its unique. It’s a place I can wander around by myself, finding some peace, some nature and some beauty”. If Chris is not helping visitors enjoy the Meadowlands he is looking out for endangered species, rescuing injured birds and making sure the unique flora and fauna of this unique ecosystem is safe from harm . “I like learning about the relationship between the birds and butterflies and the plants they use during migration. It seems there is something new in the Meadowlands every time I explore,” he says. 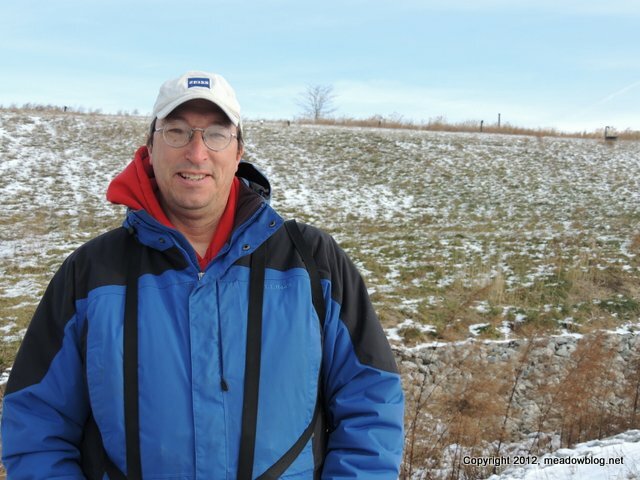 We are also very lucky to have Chris as Bergen County Audubon Society’s field trip director, volunteering his time helping people become fervent lovers of the Meadowlands just as he has. “As much as I like exploring it by myself, I like to share what I’ve learned with others,” he said. Every nature center, park or natural place needs to have someone like Chris. Someone special that protects and defends it, loves and cherishes it and still has enough respect and humility to hear its message. We are all very lucky to have Chris Takacs’ passion , dedication and devotion to a place that we all love. The next time you encounter Chris on the paths and trails looking over our Meadowlands stop and say thank you, thanks for caring, thanks for helping us and thanks for being our keeper of the Meadowlands. Meadowlands and all its wildlife is certainly a treasure. So glad that he shares it with us all. Thank you Chris!